Of conical form and constructed of four quadrant-shaped plates riveted within a framework comprised of a broad brow-band and four medially-ridged vertical bands that widen markedly to their lower ends where they are decorated with large hemispherical bosses, and converge at their upper ends beneath a similar boss forming a finial. With the collapse of the Western Roman Empire in the early years of the fifth century, the greater part of Europe found itself exposed to a succession of invasions by Goths, Huns, Vandals, Slavs and other warlike tribes, each intent on expanding into, and then holding against their rivals, the territories vacated by the departing imperial legions. The classic headpiece of this period of intense military activity was the so-called Spangenhelm (band-helmet), formed of a mosaic of riveted bands and plates. The popularity of this type of helmet was due not only to the relative ease with which it could be made, but more especially to the fact that, in an age when iron could only be produced in very limited quantities, it could be made of small plates. The earliest evidence for the manufacture of the Spangenhelm comes from Mesopotamia in the form of Sassanian examples of the fourth century, such as one in the National Museum of Iraq, Bagdad, found at the site of the Ischtar Temple in Nineveh, and another two in the British Museum, London, of which one was found at Amlasch, to the south-west of the Caspian Sea. By the fifth century the use of the Spangenhelm had spread from the Middle East to Europe. The splendidly preserved example shown here is of Ostrogothic form, closely resembling its Sassanian predecessors in possessing medially-ridged cross-bands that expand markedly to their lower ends. The same feature can be recorded in two examples of about 500 in the Hofjagd- und Rustkammer, Vienna (Inv. No. A 1996-7 & A2348) respectively found at Sveti Vid near Metkovic, Central Dalmatia, and Steinbrunn, near Lake Neusieldler, Eastern Austria, both lying within the former territories of the Ostrogoths. 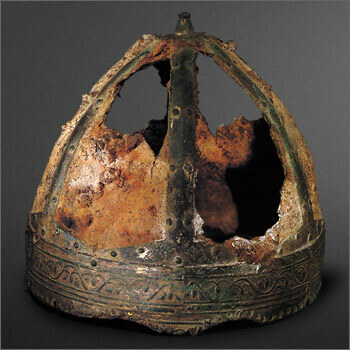 How far the Ostrogoths extended their sphere of influence may be judged from the discovery of similar helmets in such widely scattered areas as the Scandinavian island of Gotland, Eastern France, Alsace, Switzerland, Schwabia, the Lower and Middle Rhineland, Saxony, the Austrian Alps, Slovakia, Smyrna, Southern Dalmatia and Central Italy. One Ostrogothic Spangenhelm, very like the present example in both its form and details, has been found as far afield as Sabratha, Libya, and is now to be seen in the local museum there. Not inappropriately, the period in which these helmets were made is usually referred to as the "Migration Period". The helmet shown here can be seen as a rare relic of a time of unprecedented military activity that forever changed the face of Europe. 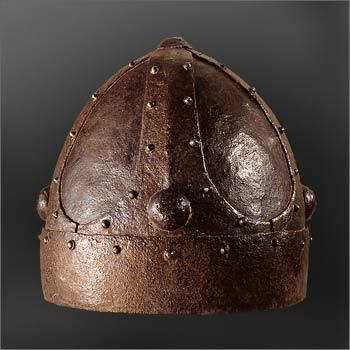 Here's a similar helmet that was originally thought to be a 10th century "viking" helm. This was later discovered to be a 20th century military helmet. (A soviet airial gunners helmet or something similar I believe) The one Nathan posted certainly looks genuine to me, I only mention this to show how some designs are adapted and continue in use for a very long period of time. Patrick, is that from the Doug Strong collection? Yes it is, known officially as the "Strong helmet". It's actually a world war two German rocket pilot's helmet. Originally it was covered in leather. The dug up veriosn fooled a lot of people! Just to be clear, Paul, since two conversations are happening, you mean the Strong helmet, right? Beautiful helmet Nathan (the Ostrogoth spangenhelm). Thanks for sharing it. Is there any evidence that it ever had cheekguards or a mail aventail attached? Yes, that's the one. I can't imagine a more fitting helmet for a "rocket pilot" can you? Notice how the core construction is very similar to the classic spangenhelm type. I think it's an interesting hold-over. Let's not focus on that too much though since the topic is really about the nice helmet Nathan posted. It's just an interesting side note. Thanks for posting this Nathan detailed photos of early helms, like the helms themselves, are in short supply, and this one is a beauty! Is there any information concerning its current location? Dagnubbit, I have been busted...I posted my 6-panel spangen here a while ago. Quite similar to the one in the first post, just without the large decorative rivets. Russel warned me that I't might come off as Ostrogothic. Anyhow, beautiful helm! Looks quite..well, solid. Functional. Something I'd trust my head to. that is a nice helm but i have my reservations about it. case in point, i have seen to other helms from the 500s and both have flush rivets. the rivets are also small in dia. this one has huge looking 3/8ths inch rivets. Both of these are labeled "Carolingian" of course. Both have smallish but not flush rivets, such as the ones Shane posted. the Truchere helm has rich repouse relief decoration all across the brow band. The Chalon helm has rich floral engraving covering all the bands. Cool book, worth picking up just for this. Both of these are labeled "Carolingian" of course. .
Is the date/location provided consistent with the "Carolingian" label? I wasn't aware of any helms that could be definitively determined to be Carolingian in origin... I'd be very interested to see them! Helmets of the migrating Germanic tribes, the so-called barbarians, were of the Spangenhelm type, constructed of iron plates fitted into a framework of bronze or iron straps (Spangen). These helmets were a translation into metal of the felt caps of the steppe nomads who had infiltrated Eastern Europe for centuries and, with the arrival of the Huns in 375, set the migration in motion. Eastern Germanic tribes, such as the Goths, adopted the horse culture of their nomad neighbors, including its arms and equipment. The Metropolitan Museum of Art’s Spangenhelm was found in France, but it was one of the distinctive group that evidently came from a common workshop, possibly the court armory of the Ostrogothic kings at Ravenna, who would have sent these helmets to allied princes as diplomatic presents. That's a nice helmet. Very similar to the one posted by Shane. I'm guessing that like Shane's it would also have had cheekguards? ya ive studied that one before its nice. check out the lil raised placed for the eyes. This one was found at Giulianova (close to Ancona), Italy. Probably from the 6th century AD. Yes, according to the Met they've been lost. At least that's my memory of this helm. It's featured on their Web site somewhere and there is bound to be more info there.